The Ioannina Lake 30K Run is a great opportunity to explore the vivid city of Ioannina, surrounded by abundant natural beauty and endowed with rich historical evidence and experience running along the lakeside of Pamvotis lake. In addition, the flat route will enable you to achieve a Personal Best! 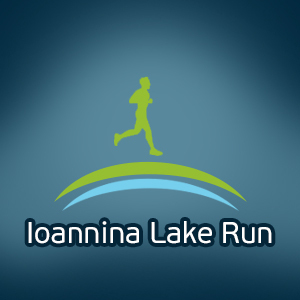 Welcome to Ioannina Lake 30K Run 2014, taking place at a place that combines of innumerable historical monuments and museums with the unbelievable natural beauty of the landscape. Ioannina, the largest city of Epirus with 120000 inhabitants and 20000 students. Ioannina is located 450 km northwest of Athens, 290 km southwest of Thessaloniki and 80 km east of the port of Igoumenitsa in the Ionian Sea. Because runners can enjoy running along the lakeside of Pamvotis lake that lies at the center of a 480 meters-high basin in a picturesque mountain setting, with the “Kyra Frosyni” Island in its middle and the sprawling city of Ioannina on its western shores. Natural beauty, historic and modern buildings come together at Ioannina, offering a vibrant and contemporary city comprising the most important commercial and cultural center in Epirus and north-western Greece. We offer several options varying from short weekend breaks in Ioannina including your entry to the race, to a full vacation plan in Ioannina and the surrounding area! Moreover, we can offer you training plans, actual training in the streets and routes of Ioannina and of course we will run with you! Registration is open until Wednesday, 10th of September 2014. Participation can be obtained via online registration. The starting and finishing line of the 30K and 10Kroute is in the waterfront Mavili Square at Molos (seawall). Runners follow a lakeside flat asphalt route. The way is on public tarred road roads, where traffic will be excluded, under the monitoring of Police Force of Ioannina. Every 1km will be numbered marking the route. There will be 6 Aid stations to support the runners of the 30km route with isotonic and water at the 5th, 10th, 15th, 20th, 25th, 27,5th and at the Finish line. There will be 2 Aid stations to support the runners of the 10km route with water at the 5th, 27,5th and at the Finish line. At the race will be in effect categories of athletes based on five-year periods. In case of no completion of capable number of athletes in any of the categories,the decades will be taken in effect. Winners of general grades will not be rewarded in their category as well. A souvenir medal will be given to all participants ,also diploma and T-shirt of the race. At the summingl grades category of men-women a cup will be granted to the 1rst winner. A medal and a diploma will be granted to the first three athletes. At the categories (five-year periods) the first three athletes will be granted a medal and a diploma. The Simple offer is addressed to those who wish to come and stay in Ioannina on their own. This offer is ideal for those who want to experience Ioannina the “running way”, and get the most out of their visit in Ioannina. We have selected the ideal locations for you, and we will suggest you the ideal vacation plan. This offer is ideal for those who want to experience Greece the “running way”, and get the most out of their visit in Ioannina and Crete. We have selected the ideal locations for you, and we will suggest you the ideal vacation plan. It starts from €120 per person (runner or not) for a two days/one-night accommodation in a 3star hotel. If you wish to stay longer, you may add as many nights as you want for an additional €30 per night per person. Please tell us all your requirements and preferences, how many days you want to spend in Ioannina, what other places you wish to visit and we will come back with a tailor-made offer specific for you! We can add trainings, running tours, car/bike rental, excursions, family activities and many more. In any case our offer will include the hotel arrangements, transportation to and from your hotel, participation to the race and all the logistics of the race entry, transportation to and from the starting line, tips and advice for the specific race, training schedule depending on your personal targets, safe keeping of your belonging during the race and suggested vacation plan for all the days that you will be in Ioannina. We can add trainings, running tours, car/bike rental, excursions, family activities and many more. In any case our offer will include the hotel arrangements, transportation to and from your hotel, participation to the race and all the logistics of the race entry, transportation to and from the starting line, tips and advice for the specific race, training schedule depending on your personal targets, safe keeping of your belonging during the race and suggested vacation plan for all the days that you will be in Ioannina. Ioannina is set on the placid Pamvotis Lake and faces sheer mountains. This idyllic setting is further enhanced by an evocative old quarter-the Kastro, interspersed with narrow lanes and architectural wonders from Byzantine and Ottoman times. The lake with the island, the cave, the modern buildings and shopping centres coexist with the well preserved buildings of the beautiful old city, the imposing monuments, the picturesque neighbourhoods, the popular-art workshops, the pedestrian walkways and the large squares. It is a city that gives the chance to experience a world where Jewish, Muslims and Christians have been meeting and mixing over the centuries against the breathtaking backdrop of a castle town that evokes the spirit of a distant past. Byzantine finds can be seen at the 'little island' of Kyra Frosyni and monasteries with splendid frescoes, together with the legendary Ali Pasha's house - last refuge. The Byzantine museum at Ioannina situated in the medieval castle within the citadel, is also worth visiting. 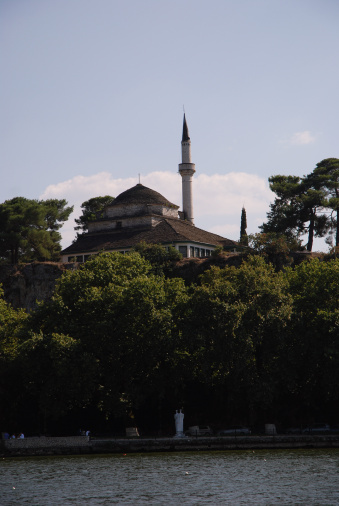 The tomb and the headquarters of Ali Pasha can also be found here. A walk along the lake shores and the castle walls, next to historical places and buildings conjures-up legends such as that of Kyra Frosyni. She was sentenced to drown in the lake after having caught the eye of Ali Pasha who desperately fell in love with her. The city boasts a wide range of sporting and recreational facilities including indoor swimming pools, football and basketball stadiums, theaters, cinemas, Art Galleries, Museums, dancing floors and many colourful bars and pubs. There are also countless opportunities for extreme sports in beautiful natural locations. It is famous for the production of feta cheese and for its popular art of golden and silver jewelries and wood sculpture. The Archaeological Museum of Ioannina exhibits finds from Epirus ranging from the Paleolithic period to Roman times. They include artefacts from the sacred area of what claimed to be the oldest-known oracle in ancient Greece in the Temple of Zeus at Dodona. It is worth visiting Zayorohoria, on the north east of the city of Ioannina which is a complex of 46 picturesque traditional villages built in a magical setting amidst pine and fir trees with a unique traditional architecture, impressive stone mansions and undulating, natural forest surroundings.